Do you love lasagna but tomato-based products trigger your heartburn? Now you can enjoy this Italian classic—with a bit of a twist—with this low-fat, no tomato sauce lasagna recipe. This recipe centers around lean ground beef, beef broth, low-fat mozzarella cheese, and a creamy homemade low-fat Alfredo sauce instead of a traditional red pasta sauce. This makes for a slightly different but delicious lasagna that the whole family will be begging for. As an added bonus, this recipe is low in fat—the lean ground beef, low-fat cream cheese, skim milk and skim mozzarella cheese make for a creamy and hearty but healthier comfort dish. Heat oven to 375 F. Put a large pot of salted water on to boil and cook the lasagna noodles until just tender. Drain well. While noodles are cooking, coat a nonstick frying pan with nonstick cooking spray and brown ground beef. Pour off fat. In a large bowl, add the browned beef and beef broth. Toss together. In a small mixing bowl, combine cream cheese, 1/4 cup milk, and flour. Beat until well blended. Slowly pour in remaining 1 cup skim milk and beat until smooth. Melt butter in large, nonstick saucepan over medium heat. Add the milk-cream cheese mixture and continue to heat, stirring constantly, until the sauce has thickened about 4 minutes. Stir in Parmesan cheese, adding salt and pepper to taste. Spread 1 cup of the low-fat Alfredo sauce on the bottom of a 13x9-inch baking pan. Add 3 strips of lasagna noodles and spread half the beef mixture on top. Lay down another 3 strips of lasagna noodles. Spread the remaining beef mixture on top and lay down the remaining 3 strips of lasagna noodles. Spread the very top with remaining 1 cup low-fat Alfredo sauce. 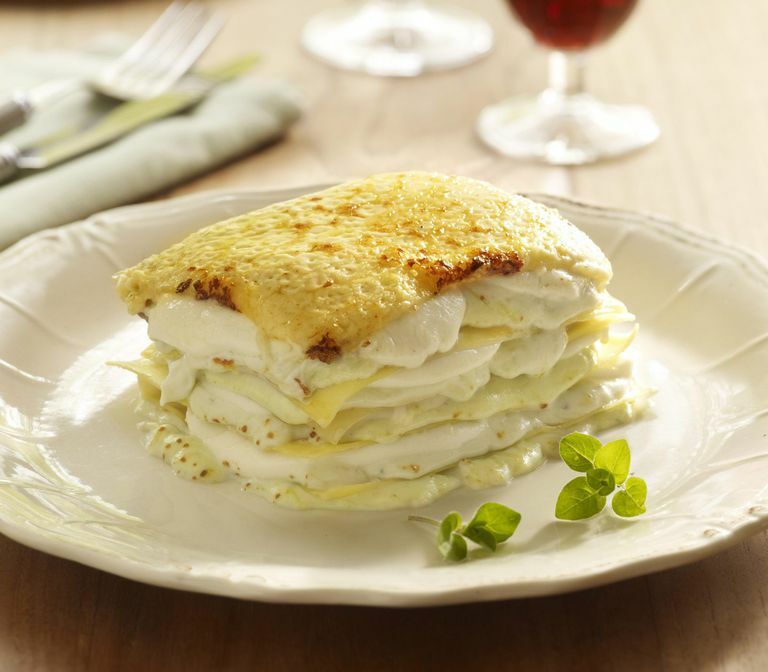 Sprinkle with mozzarella cheese and bake for 25 to 35 minutes until bubbly and golden.